TRONDHEIM, NORWAY – August 7, 2013 – Dirtybit, a leading Norwegian mobile games studio, today announced that Fun Run, a real-time multiplayer racing game, has achieved 30 million total downloads on iOS and Android platforms. Originally launched in September of 2012, Fun Run has 10 million monthly active users and has hosted more than 1.5 billion online gameplay sessions to date. 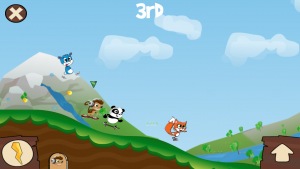 Fun Run pits friends, foes, and strangers against each other in side-scrolling races full of havoc and mayhem. One of the first successful real-time multiplayer games available on iOS and Android, the game is also an international hit. Shortly after launch, Fun Run achieved the #1 spot on the iTunes App Store in the US, as well as in nine additional countries across Asia, Europe, and the Middle East. In addition, the title has recently been localized to support eight different languages across the globe. In the wake of this success, the developers at Dirtybit have begun work on their next game, which will be available in the fourth quarter of 2013. While multiplayer game options on the App Store and Google Play Market are mostly limited to asynchronous, turn-based games, the success of Fun Run shows that mobile gamers want real-time competition with their friends and peers. The popularity of Fun Run proves that fast paced multiplayer games can succeed in the mobile market and can resonate well with mobile gamers. For more information please visit www.dirtybit.com and follow Dirtybit on Twitter at @DirtybitGames. One of Norway’s most promising mobile gaming startups, Dirtybit is made up of a small team of dedicated developers who believe in challenging themselves and taking chances in order to create new and exciting games. The studio’s mission is to let friends play together, anytime, and anywhere. This is reflected in the real-time multiplayer racing game Fun Run, an international success with 30 million total downloads.